4. Manipulate the handle of support leg to lift the crawler away from the ground, fine-tuning the four support leg to make sure the drilling rod vertically. 2. 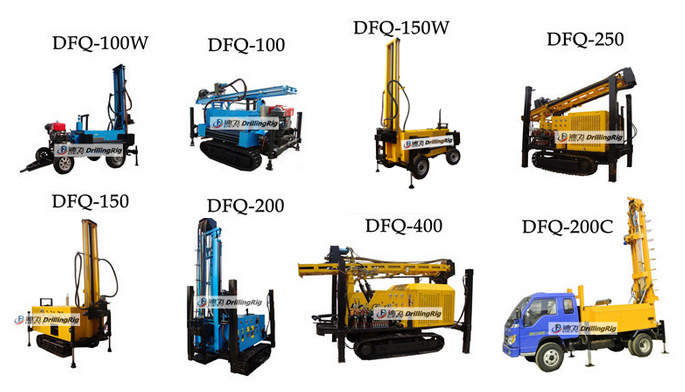 Blow all the foreign matters in air-supply hose, inner rods and joints before and after working. 3. The working pressure should be more than 1.05MPa. 6. Pay attention to the diameter changes when you replace the bit. Do not need to replace the bit if wear-hole of bit has not drilled yet. 7. Do lubricate maintenance in accordance with the requirements strictly to Make sure the drilling rig always be in good working condition. 8. Check the self-lubricating parts with oil cup every two hours. Check the engine and supplement the fuel once a week.